Obituary – Svelan, Alice Mae (Martin) « Perry High School Alumni Association, Inc.
﻿Red Hot; Normal Training; Orchestra ’22, ’23; Forensia; D. D. D.
﻿Rosary will be at 7:30 p.m. Thursday at Brown Funeral home chapel for Alice Mae Svelan, 81, 1320 Fifth street, who died early Tuesday at Perry Memorial hospital. Funeral mass will be at 10 a.m. Friday at St. Rose of Lima Catholic church. Rev. Ward J. Pankratz, pastor, will officiate. Burial will be at St. Rose of Lima Catholic cemetery. The daughter of Edwin and Ida Martin, she was born at Perry, Oct. 7, 1906. She attended St. Joseph’s Academy and graduated from Perry high school. She also was a graduate of Central State Teachers college. Mrs. Svelan taught at Rose Hill school and St. Joseph’s Academy. 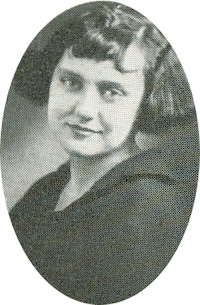 She and Steve Svelan Jr. were married at Perry, Jan. 17, 1929. Mrs. Svelan was the first curator at the Cherokee Strip Historical museum, serving from 1968-1978. She was a member of St. Rose of Lima Catholic church, the Altar Society, the Marigold unit of Perry Garden clubs, Noble County Republican Women, Perry Business Women and the Cherokee Strip Historical Society. Survivors include two sons Jack, of Newport News, Va. and Bill, of Richardson, Texas; six grandchildren; one niece, Kathleen Smith, Stone Mountain, Ga.; and a nephew, Jerry Jahlicka, Enid.